There is no set formula for a sports venue to reach mythical status—“mythical” being defined as “I need to experience it before I die.” Some of the ingredients are tangible: longevity, success of the team that plays there, a history of signature games in the venue. But there are always intangibles as well. That’s what makes a foray into such a place for the first time a memorable experience. Cameron Indoor Stadium, home of Duke basketball, has certainly reached such status over the 79 years of its existence. It is small by NCAA standards (seating 9,314) and also well camouflaged, tucked among buildings of similar architecture on the Duke campus. In fact, it would be possible for passersby not to even realize that they are walking by a basketball arena—although the 70 tents erected outside the building, as students camp out for tickets to the UNC game weeks or months in advance, give some idea that something is up. Incidentally, the rules of “tenting” for tickets to the Duke/UNC game are longer than the U.S. Constitution. Having spent three years at the University of Virginia (for law school) during the Ralph Sampson era, I am not exactly a Cameron Crazy. Nevertheless, since I have progeny currently in graduate school at Duke, I figured I would take the opportunity to see what all the fuss was about at Cameron Indoor, home to the five-time NCAA champions. My inaugural game was a year ago, Duke vs. Virginia, and I was treated to a mouth-watering matchup that UVA won by two points. This year, I had the chance to join the Cameron Crazies, or at least the semi-Crazies, since the aforementioned progeny is working as a graduate student usher for Duke home games. I first had to pick a game for which she would have a chance of getting one of a very limited number of guest passes—a pass that would allow me to stand on the floor in front of the graduate student section behind the basket closest to the Duke bench. 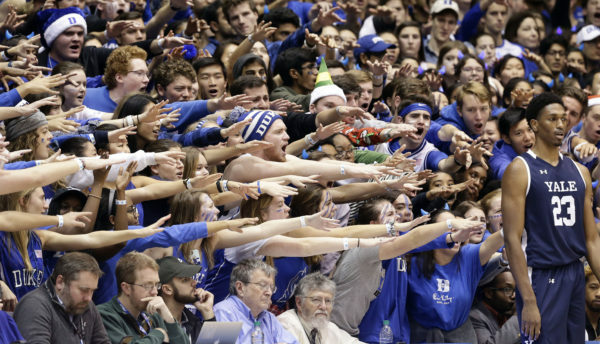 The real Cameron Crazies (the undergrads) would be to my left, occupying the entire side of the court. There are no seats in either of those sections, which of course allows for more students to be packed in—part of Cameron’s “charm.” I picked the Duke vs. Syracuse game in January since it was on a Monday night (lessening demand a bit), and it was against an ACC opponent other than UNC, UVA or another matchup that would make a guest pass impossible. It would also have the added cachet of seeing a contest between the two winningest coaches in NCAA Division I men’s basketball history, Mike Krzyzewski and Jim Boeheim. The first thing anyone notes when stepping into Cameron for the first time is indeed how intimate and old-school it is. The fans are right on top of the players, and when the Crazies file in en masse, the atmosphere is established. The decibel level starts rising 45 minutes before game time and doesn’t cease until the game ends. This is not Notre Dame Stadium (also an iconic venue), where you are called upon to “wake up the echoes.” The voices here never relent enough for there to be echoes. The lengthy pregame rituals include a spine-tingling video of the greatest moments in Duke basketball (of which there are many), and the Crazies work the rest of the crowd, including the only slightly more subdued graduate-student section, into a furor as the game starts. And that’s when I have my second reaction: How can these guys ever lose in here? The answer is that they rarely do. That feeling is soon reinforced. Duke, led by three of its four elite freshmen, Zion Williamson, RJ Barrett and Tre Jones, sprint to an 11-0 lead. The volume level also goes to 11. The third thing that stands out is what a physical freak and monumental talent Zion Williamson is. How can a man that big be that light on his feet and move as fluidly as he does? He is a sight to behold. It is Tre Jones, however, who adds the energy to stake Duke to its early, big lead. His work rate is impressive on both offense and defense, and his field generalship brings cohesion to the all-star cast, three of whom may be taken in the top 10 of the NBA draft, with a fourth who may go somewhere in the first round. I realize that I am watching something really special, and, while the stands behind me shake, I temporarily forget how much I rooted against this team several decades ago. To the question: “How can Duke ever lose in this place,” I soon have a possible answer. Already missing Cam Reddish in the lineup due to the flu, Jones suffers a shoulder injury several yards in front of me. Duke is now without two of its starting five, one of whom is the primary on-court decision-maker. The nature of the game changes immediately, and I am treated to the sight of Coach K and Boeheim showing why they have more than 2,000 NCAA victories between them, as they maneuver chess pieces in directions that they did not anticipate before the game. Syracuse gets back into the game after Jones’ injury, and the teams trade momentum until the end of the regulation. Overtime—it’s my lucky day! Five extra minutes of basketball in this shrine. The Crazies are still in full throat. However, even they cannot push a weakened Duke side to victory, and unranked Syracuse stuns No. 1-ranked Duke. 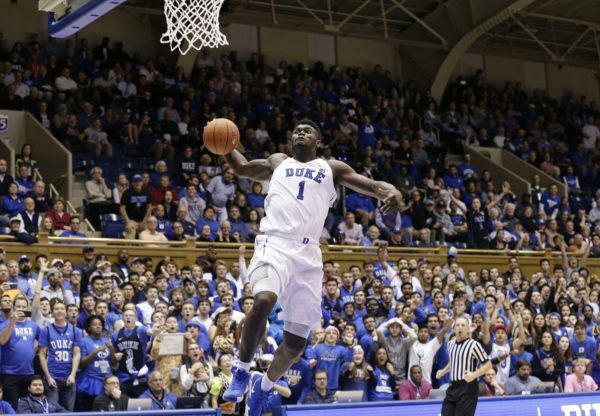 It is the first time that Duke has ever lost to an unranked team at home while ranked No. 1. In fact, Duke has lost fewer than 20 times at Cameron over the past 15 years. Remarkably, I have now been at two of those games—the only two games I have ever seen at Cameron. It occurs to me that I may be the only person alive who has been to Cameron for more than one game and has yet to see Duke win there. I am labeled a curse by my daughter and other Crazies, making the chance of an invitation to join the student section again less likely. However, visiting teams at Cameron should take note: I may no longer be welcome among the Crazies, but based on my track record you may want me in the house. If so, I will be there. It’s a venue that lives up to its reputation. 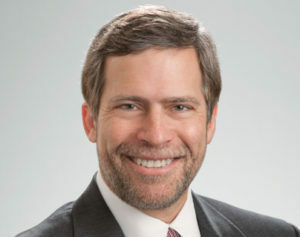 Bob Latham is a partner at the law firm Jackson Walker, L.L.P., and a World Rugby board member. A compilation of his best columns titled “Winners & Losers: Rants, Riffs and Reflections on the World of Sports,” is available for purchase at amazon.com.